Pictures are taken. Will these memories be treasured forever? 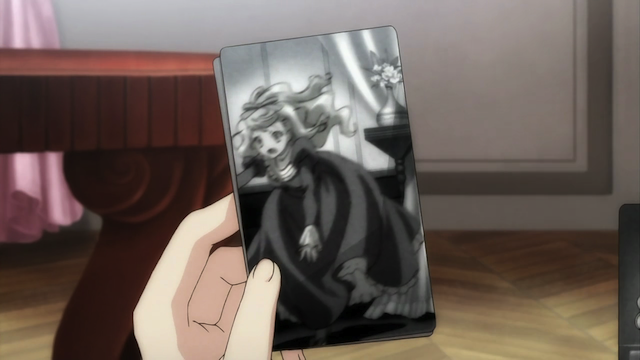 Episode 6 of Ikoku Meiro no Croisée (Crossings in a foreign labyrinth) brings Alice back. Being rich, she has relatively easy access to photographers, and she wants a picture of Yune and herself. Yune is easily swayed with the idea that she can send the photo to her sister in Japan, and so another zany day at the Blanche family home is spent. Camille Blanche: beneath the frills, Alice's elder sister seems to harbor a painful secret. As usual, this episode considered an aspect of the cultural divide, especially the differences between the Japanese-style and French-style clothing. For her part, Yune teaches Alice how to properly dress in a kimono, and Alice responds in kind by teaching Yune about western footwear, and “birdcages”, or crinoline, an armature worn under dresses to make them billow out. Most interesting, however, was the hints dropped by the ever elegant Camille, that being a fashionable lady might not be completely satisfying. There is even a hint that Camille and Claude have some sort of history. This was a rather unexpected turn, as it provides an alternate, previously unsuspected reason for Claude’s bitter comments about the corrupting influence of wealth. All and all, an enjoyable episode. This show really excels in providing little to no plot, while providing a rich description of the atmosphere of late 19th century France, and tossing in little life lessons to mull over as we enjoy the eye candy. 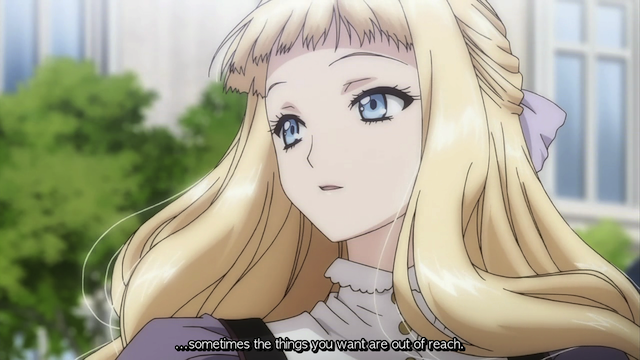 Again, Alice is abrasive, even selfish, but she is hardly evil. Her deep respect for her sister is touching, and she always seems to genuinely enjoy Yune’s presence. This is not really a show about conflicts, but about learning to get along with others who might at first seem strange or difficult. What I do hope is that Claude has someone to ‘clash’ with regarding his ideologies – the show feels like it’s just brushing aside all of his repeated rants about the rich, instead of facing it directly and dealing with them. In the most recent episode he was clashing quite a bit with Yune (although it was over his attitude towards the poor, not the rich).